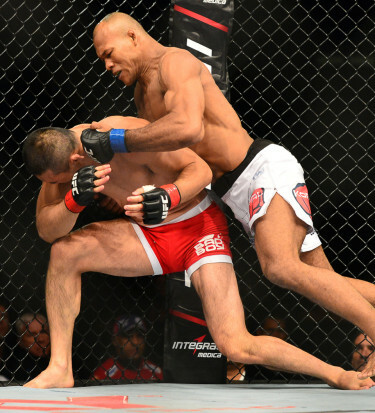 At 3-0 in the UFC, Ronaldo “Jacare” Souza is ready for another fight. Along with most everyone else, he knows he’s pushed himself way up the rankings with his recent performances. But unlike some guys who prefer to walk in the side door, Jacare is calling out some big dogs. His preference of course is to fight the winner of the Lyoto Machida vs. Chris Weidman title fight at UFC 175. But if he doesn’t get that one, he wants Vitor Belfort, perhaps the most dangerous middleweight contender in the company right now. Kudos to Souza for that call out. I’m getting used to seeing people call out Michael Bisping for some reason. And Jacare has also made it known that he’s ready to fight for a title now, literally. In the unfortunate event of an injury to title challenger Machida, Souza says he’ll be ready to step in to save the main event. Wait, is he actually predicting that something will happen to Lyoto? Hmmm, if I was the Dragon, I’d keep my head on a swivel. Anyway, if that injury doesn’t take happen, Souza will likely have to fight before getting the title shot. Belfort seems like a perfect opponent. He was already tabbed as the #1 contender before pulling himself from the event.